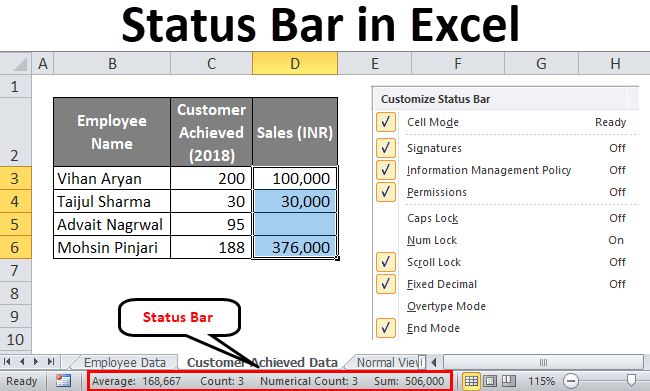 Status Bar in Excel | How to Customize Excel Status Bar? 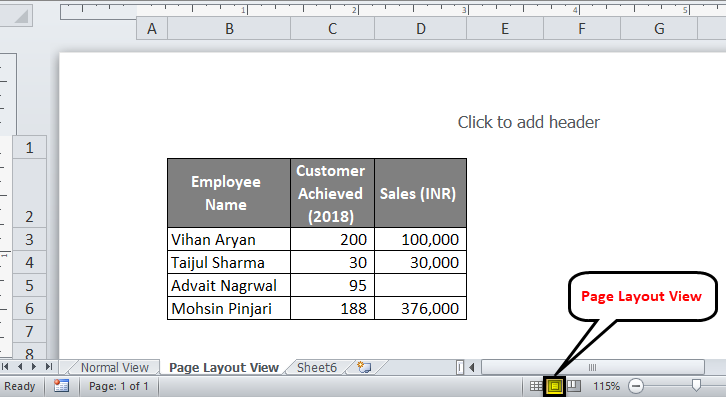 How to Customize Status Bar in Excel? “Status Bar” as the word suggests, returns with the status of some simple options in excel. The status bar can be found horizontally at the bottom of the any excel workbook. 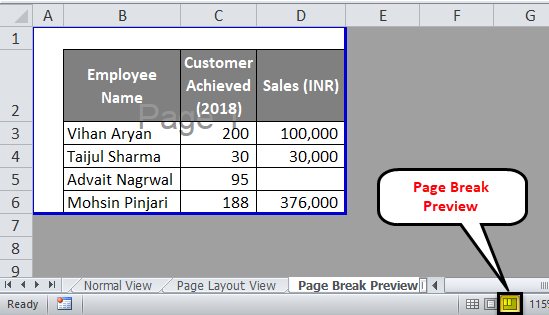 Status bar gives a quick view for some of the options like page number (number of pages in the workbook when you are working on Page Layout view or Print Preview view), Count of cells, Sum, Average, Minimum & Maximum (Disabled by default), Numerical Count (count of numerical values in the selected range of cells), etc. The status bar is the same for all office applications (MS Word, MS PowerPoint, MS Access). By default, some of the options are already active in excel status bar like Count, Sum, Average, etc. However, what if we need some of them which are not active by default like Minimum, Maximum, etc? We need to customize the status bar so that these options can be active as well. Right click anywhere on the status bar and the customization bar will pop up like in the image shown below. Now check (√) the options which you want to be displayed on the status bar (Like Minimum and Maximum). All the options having a check (√) in front of them are now active on the excel status bar. You can also deselect/uncheck some of the options which you don’t want to see on the status bar. Note: If you want to come out of Customized status bar, simply click anywhere in the sheet outside the popped-up menu. 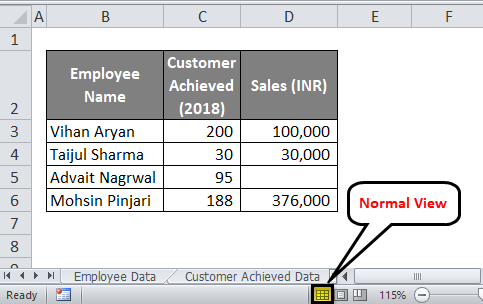 In this tutorial, I will cover some of the options which are enabled by default in excel status bar as well as some of those which are not enabled by default but could be handy if added in there. Ready – It means the cell on which you have your cursor currently is ready to take user input from you. It can also be considered as in general state, where the cell has no input data. Enter – It means that, the user has either started typing the data in the cell or pressed F2 twice to edit the cell. Word entered itself suggests that input entering has been started. Edit – It is quite like Enter. It means the cell is being edited (old data is being replaced by new data). 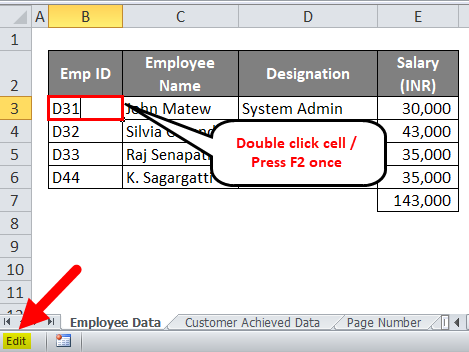 It is displayed when the user double-clicks the cell or presses F2 once. 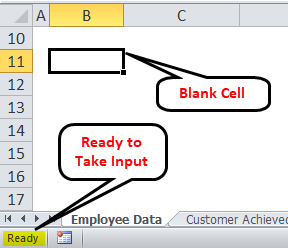 Point – It gets activated when the user enters a formula in a cell while providing other cells (which have data in them) as input to the formula. Please see the attached sample image for your reference. If you are working on excel frequently, you might be well known to this option which is provided at the rightmost corner of the status bar. 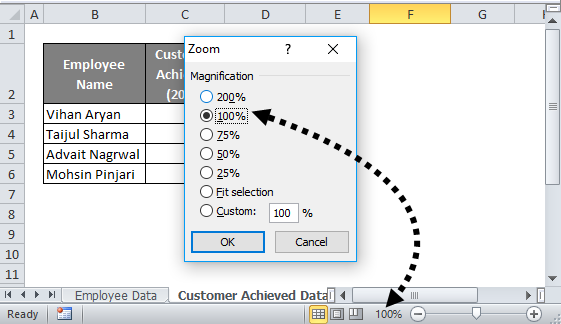 Zoom slider allows you to quickly zoom in or zoom out of excel worksheet you are working on. Moreover, it has (+) (-) keys which can be used for “Zoom In” and “Zoom Out” respectively. Using Zoom In, you can magnify the current worksheet and have a closer look at the data. Zoom Out helps you to reduce the magnification of worksheet and you can see more data in a single shot. See the below sample image for your reference. Zoom percentage can also be used to magnify the worksheet and can be considered functioning the same as that of zoom slider. It is situated next to zoom slider on the left hand side of the status bar. Once you click on zoom percentage, the zoom dialog box gets open, from where you can select magnification percentage for current worksheet. 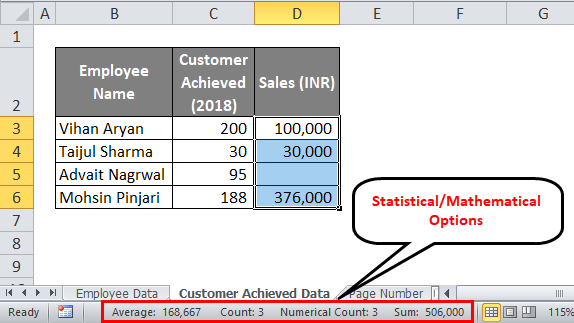 There are some statistical/mathematical options for a quick calculative view of the numeric data in the Excel status bar. These options are enabled by default. Let’s get through those. 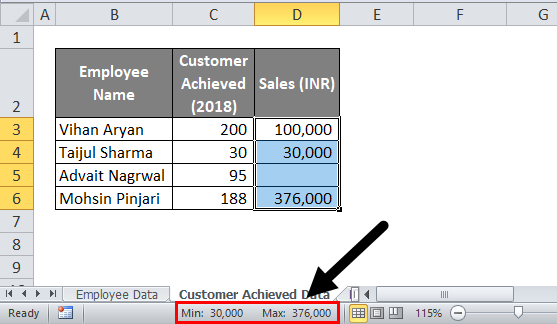 Count – It counts the number of non-empty cells from columns/rows. (irrespective of data type Numeric/Character). Average – It gives an average of all the non-empty cells from columns/rows. Sum – It does what exactly the word suggests, sums up all the numeric values. 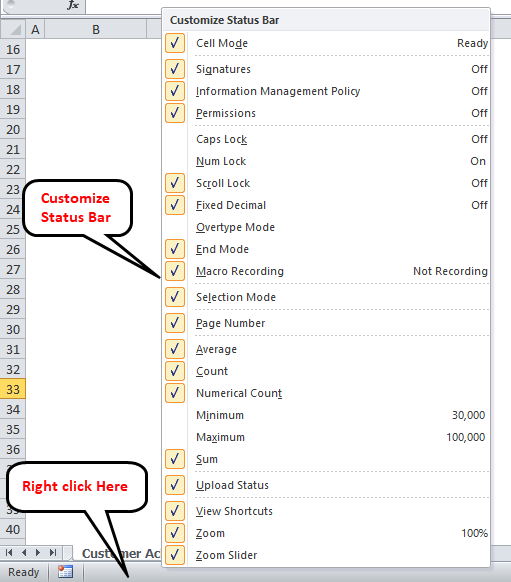 Numerical Count – This option is not enabled by default, so you must enable it through excel status bar customization. 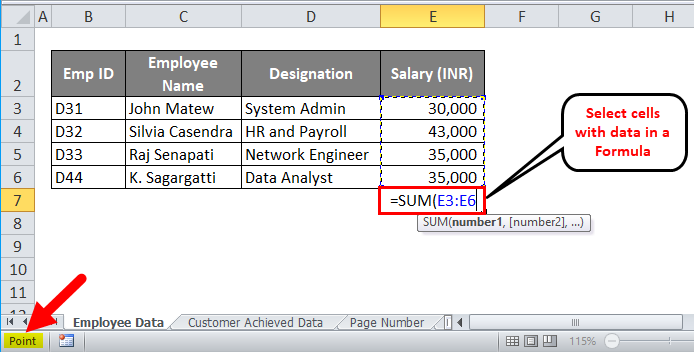 This option allows you to capture a number of numeric entities in a column. It becomes more useful when you have mixed data values (Numeric + Character/String) in cells. Note: Please note that the Average and Sum options can only be used on those cells which have numeric values. These two are again some of the useful options for mathematical/statistical calculations. What if you have a large amount of numeric data (for ex. 20,000 cells) and you wanted to have a look at Minimum and Maximum value from the same? Would it be possible to have a judgment with naked eyes? Not possible. That’s the reason these two options are there in a customized status bar (Not enabled by default). Minimum – If enabled, Minimum option shows a minimum value on status bar from given non-empty numeric cells. 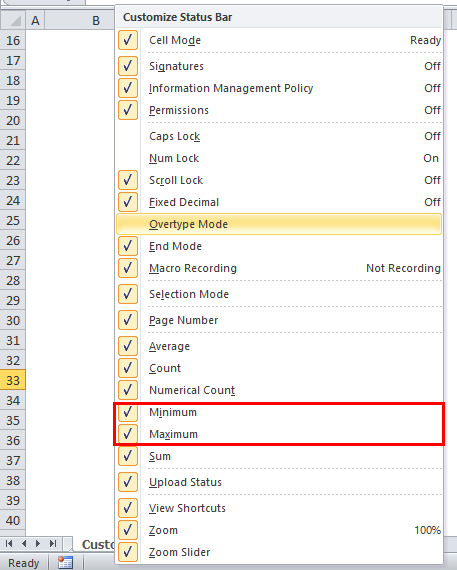 Maximum – If enabled, the maximum option gives us a maximum value on status bar from given nonempty numeric cells. This feature is enabled by default and can be handy to switch between different worksheet views like Normal View, Page Layout View, Page Break Preview. This option can be found at the bottom right of the Excel status bar (before Zoom Slider). 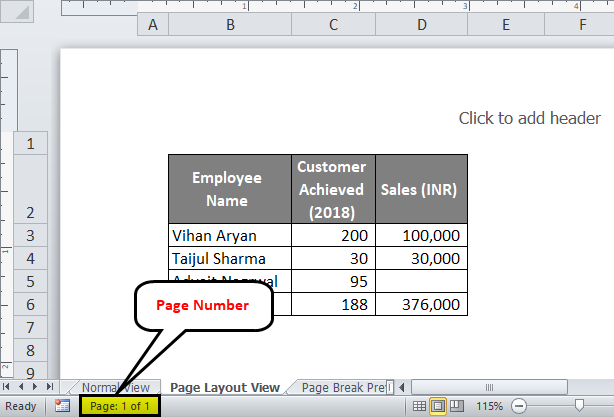 The Page number option is very useful when you are in Page Layout View in your worksheet. It is enabled by default and gives a number of pages which are currently being in use (A page in a workbook is said to be in use if user is editing that page). That’s all from my end guys, we will take a moment to quickly wrap up the things with some Things to Remember. 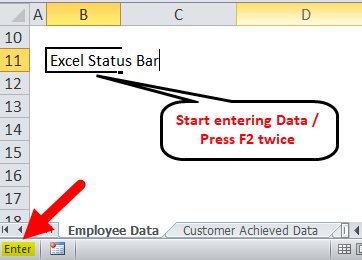 Status Bar in Excel gives the status of some simple but frequently used options like Sum, Average etc. Some of the options are only feasible with numeric data Eg. Average, Sum, Minimum, Maximum etc. Some of the options are feasible with numeric as well as string (character) data. Eg. Count. Not all the options are active/enabled by default, you can customize the status bar in excel options anytime you feel. How to Use Solver Tool in Excel?